When it comes time to replace your flooring, consider taking advantage of our great deals on high-quality vinyl flooring in St. Paul, MN. The type of flooring material is growing increasingly popular and offers customers many different options. Whether you want vinyl tile flooring that looks like ceramic tiling or vinyl plank flooring that mimics the appearance of hardwood floors, we have what you seek. With new vinyl flooring products entering the market on a regular basis, it’s never easier or more affordable to upgrade your home with new flooring in the style you always dreamed of. When you shop at our location, you can choose from a vast selection of vinyl that is sure to impress in every respect. If you want beautiful floors in your home, but you cannot afford certain high-end options, then consider vinyl sheet flooring. These vinyl floors are designed to mimic the look and feel of other expensive materials for a fraction of the price. The latest vinyl products perfectly replicate wood, stone, and other types of premium flooring materials. In addition to being more of the more cost-effective options, vinyl sheet flooring is incredibly simple to install. Our flooring experts can come to your home, take the necessary measurements, and perform the installation in very little time. Since the vinyl flooring installation process does not take long, you also save on the cost of labor. We make sure your new flooring is a perfect fit for the layout of the rooms where we are doing the installation. Everyone appreciates the aesthetic appeal of ceramic and porcelain tiles. It is a big reason why so many people choose to put in tile flooring in their kitchens and bathrooms. Another reason is how resilient tile is. It is resistant to water and is extremely strong. The only problem is does not fit within some people’s budget. The good news is there is a type of flooring that offers all the same benefits of tile flooring but at a much more affordable price. 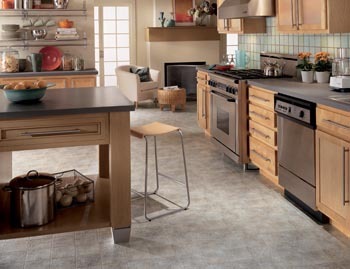 Vinyl tile flooring is as durable as real tiling made from ceramic and porcelain. It is also resistant to the most common forms of damage experienced throughout a household, so you don’t have to worry about scuff marks and surface scratches. Since we offer vinyl tile flooring that imitates the appearance of other flooring options, you can get any style you want. Visit our flooring store to check out our impressive inventory of vinyl plank flooring. As the name suggests, this vinyl product is manufactured to resemble the planks of solid hardwood flooring. With varying grains, textures, and finishes available, you won’t even be able to tell the difference between the vinyl material and real hardwood. The vinyl plank flooring in our store is manufactured by some of the industry’s leading brands. By utilizing the buying power of the Flooring America name, we save on high-quality products that deliver quality and longevity. These savings are passed directly on to clients like you, ensuring you get the best deal on the ideal floors for your home. If you want to be sure your vinyl plank flooring looks and functions as it should, allow us to handle the installation. Our installers have experience putting in floors in rooms of every size and layout. We use specialized tools to ensure the new flooring is securely attached to the subfloor. After we finish the installation, your new floor will look flawless and last a very long time. With so many flooring options to choose from, it’s possible to feel a bit overwhelmed about what style to choose. We make shopping for new floors easy and enjoyable by assisting you through the selection process. Our in-store associates take the time to understand your expectations in aesthetics, longevity, and even price, allowing us to narrow down the selection to the styles most likely to suit your preference. We frequently recommend vinyl wood flooring for clients interested in the perfect balance between style and practicality. With these floors, you get the high-end statement you desire, along with the long-lasting durability your family needs. Many homeowners fail to realize that receiving a proper installation is just as important as investing in quality flooring. We are happy to back purchases made at our location with professional installation services. The first step in every vinyl floor installation is to measure the areas that are receiving new floors. This measuring process is included in your free consultation, and is provided at no cost to you. After we finish the measurements, we give you a free estimate on the total cost and schedule a date to come back and do the installation. Our technicians always utilize the best methods and materials to ensure your new floors stay safely secured for years to come. Once the installation is complete, we still remain committed to your satisfaction. We prove this by offering a Lifetime Installation Guarantee and Confidence Plus Warranty. This guarantee means if you experience any installation-related issues, you can depend on us for a resolution, free of charge. The warranty covers also clients who have recently purchased qualifying floors. If you are unsatisfied with your new flooring for any reason, we replace it with a similar product, also completely free of charge. Your satisfaction is our main priority, which is why we offer such outstanding warranties for flooring installations. Contact us today for more information about the vinyl flooring currently in stock at our store. We proudly serve the communities of St. Paul, Minneapolis, Maplewood, Woodbury, and Cottage Grove, MN, as well as the surrounding areas.